Please send me e-mail with more info, photos, etc. 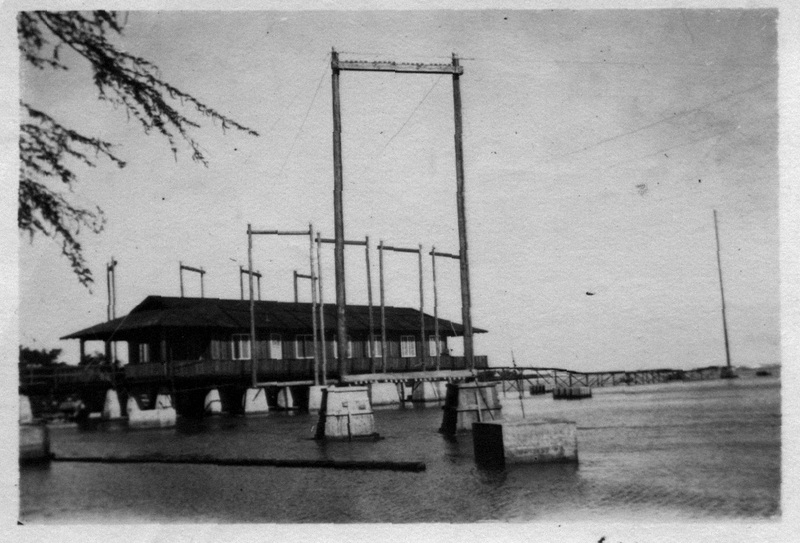 Plans were drawn up in 1919 for a receiving station at Wailupe . When the buildings were completed in late 1920 this station was considered one of the largest receiving stations in the world. Two 47-foot antennas were located at each end of the operations building, which was built out over the ocean, and four shorter poles were planted along each side to position loops for receiving from San Diego , San Francisco , Guam, Japan, and Manila. Initial facilities were arranged so that six messages could be sent and received simultaneously. Various local circuits connected Wailupe with commands throughout the Hawaiian Islands. photos by Harold B. "Skinny" Phelps - Brian Phelps writes - "My Grandfather was a wireless operator on Wailupe during 1921. His name was Harold Bartle Phelps Sr. His Navy buddies called him “Skinny”. After Hawaii, he served in Samoa, Bremerton, WA, and other places. He was recalled to active duty during World War II where he served as a wireless operator again, this time in Alaska on Woody Island among other places." 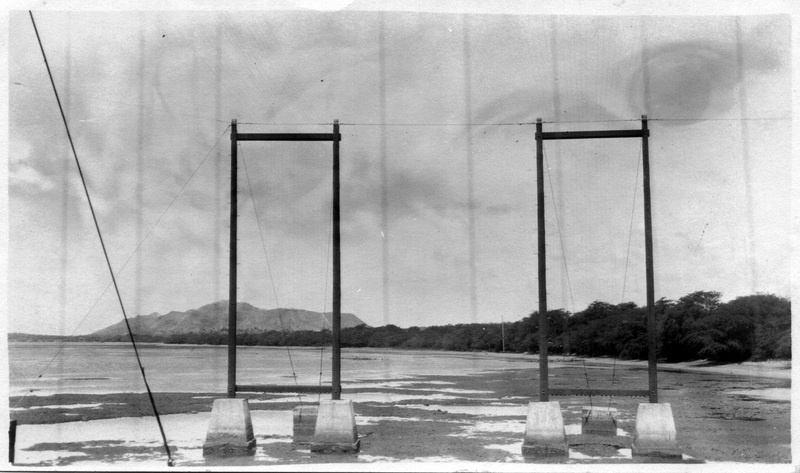 1919 - In 1919 a location for a remote receiving and control station was chosen at Wailupe, Oahu, about seven miles east of Honolulu, close to the Marconi station at Koko Head. Harold B. Phelps, LT USN RET, was stationed at Wailupe from 1919 until 1922. His story of the establishment of the Wailupe station was published in the Naval Communication Station, Honolulu, "Trade Winds" issue of 25 June 1970. "When we entered World War I, the Navy simply moved a recruiting crew to the commercial station and signed up the entire crew in various ratings in the Naval Reserve, put uniforms on them, and continued to utilize their communication skills under Navy supervision. 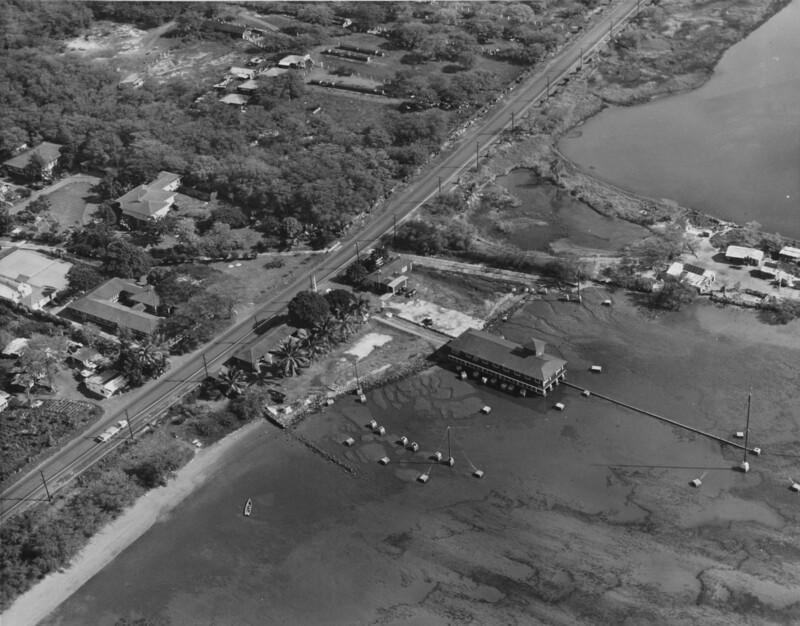 The temporary station at Wailupe was probably built around the first part of 1919 and NPM moved there to allow the Kahuku and Koko Head stations to be remodeled. Almost the entire crew of operators at Koko Head was sent to Wailupe as USNR, supplemented by such regular Navy radiomen available. In those days not too many Navy operators had experience in handling commercial traffic. 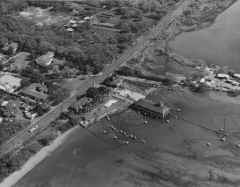 The Navy purchased a piece of land at Wailupe for the temporary station and it was very temporary as plans were in the making for a permanent station at Wailupe. There were three booths, more like chicken coops, scattered on the beach. Each booth. of crude construction, had room for two circuits. The roofs leaked and some of the operators had to sit under an umbrella suspended from the ceiling to keep water off the equipment. Or we would search around the yard for a scrap of tarpaper or some boards to lead the water off the operating position. There were no signals piped in. Receiving antennas were strung between trees and poles. All control wires were very haywire, no soldered connections and very few even taped, which brought on intermittent wire trouble, rain or shine. There was an old house on the land. It was one big room, no doors, windows or screens. This housed the office, file rooms, ship to shore circuit and the land wire to the Honolulu city office (HU) and the office in Pearl Harbor (PH). Anyone working in this house after dusk had to put rubber bands around the bottom of their trousers and have several sticks of mosquito punk under their chair to be able to stay there. If they forgot to bring their punk or couldn't find someone else's cache they would stuff an old rag in a can and light it off. Anything was better than those mosquitoes. We stood a three section watch, seven days a week, no rotation of watches, no days off. 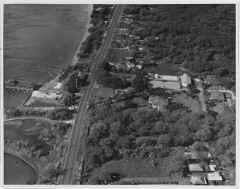 Straight 8 on and 16 off, and that's the way it was at the start of NPM at Wailupe as a Government and commercial traffic station. When I went there in August of 1919, NPM had schedules with NPL (San Diego), NPU (Tutuila, Samoa), NPN (Guam), and NPO (Cavite). There was no direct daylight communication with NPO or JJC (Japan). NPO broadcast to NPM at midnight. NPU broadcast to NPM at 2 a.m. and NPM broadcast to NPU at 9 a.m. None of those circuits were reliable at all times due to static and fading periods. We just kept the traffic moving as best we could, all by hand, on low frequencies. Practically all traffic for Cavite and the Asiatic Fleet was relayed through NPN. The Navy had been searching around for a piece of land for the permanent station and finally had found some school land that was suitable, for which they traded the temporary site, and started construction of the permanent. buildings. The new site also gave room for expansion up the hill in back of the reservation. The station was completed early in 1921. It was built over the water to provide more land space for the proposed DCOs quarters, two duplex CPO quarters, and the single men's barracks. These were completed late in '21 or early in 1922." "In the fall of 1923, I was transferred to the Naval Radio Receiving and Control Station at Wailupe.. There was a shortage of high speed operators at that time. The permanent buildings at Wailupe had been completed only two years earlier. 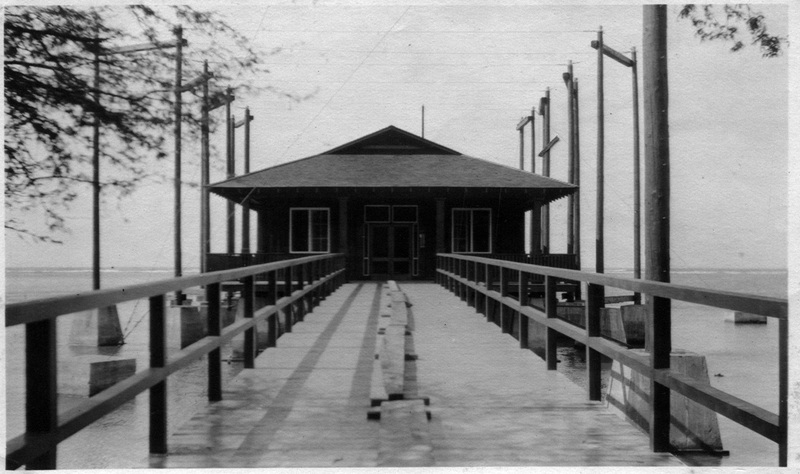 As described by Mr. Phelps, the operating building was located over water on the shore of the bay. (Waialae Bay extends from Diamond Head to Koko Head ) . It. was a rectangular, one story building on pilings in the water. The building was divided into compartments or booths, seven on each side separated by a hallway extending the full length of the building. The front of the building contained the wireroom and the Traffic Chief's booth on the left; the office of the District Communication Officer, Lt. Comdr. Frank Loftin, and the office of the Chief Radioman in Charge, D. A. Chauncey, on the right. 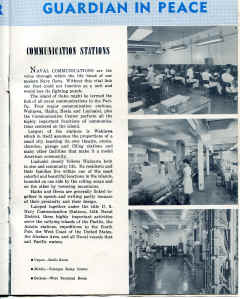 The wireroom had Morse code landline circuits to the Old Naval Station in Honolulu (HU) for transmission of commercial, other government department traffic, and press news dispatches for the Honolulu newspapers; and a circuit to the Communication Office in the Pearl Harbor Navy Yard (AD). All message traffic was processed through the Traffic Chief's booth for circuit routing and filing. Despite improvement in equipment, reception was still difficult at times due to static, and fading signals. Separate booths were provided for operators on each circuit to minimize the additional distractions from outside noises. Prior to and during WWI, receiving equipment had been vastly improved. The Navy had designed the Models A, B and C receivers and later the SE-143, SE-1120, SE-1530, SE-1899 and others, and separate units such as the acceptor-rejector and the ultra-audion. I found all of these types in use at Wailupe. The Baldwin type headphones were standard, with their hard bakelite earpieces which could be adjusted to the ear by sliding the earpiece up and down on metal rods attached to the canvas covered headpiece." "I reported to Wailupe for my second tour of duty in 1934, serving as one of the Traffic Chiefs until I went back to the Fleet in 1937. The general appearance of the station had not changed much since I left there in 1925. The road JRst the station had been paved. The control station was still in its original location, however the shore line had been filled in, a breakwater built, the bridge over the water to the control building had been replaced by a paved walkway up to the front steps of the building. One additional set of duplex quarters had been built between the two original duplexes. 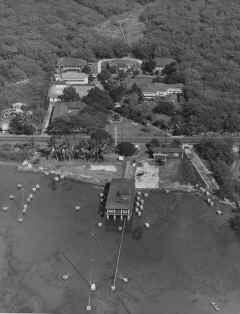 A tennis court, swimming pool and recreation building had been constructed between the single men's barracks and the CPO quarters at the back or the station. A diversity receiving station had been built on top or the hill behind the quarters. The inside of the control building was completely changed. All of the former isolated operating booths had been dismantled, creating one big operating room. RAA, RAB and RAC receivers were mounted at the sides of the room on individual metal frames, bolted to the floor. Operating tables were portable, on casters, which could be moved to any receiver position. Plug in controls were built in to each table and receiver position. The main circuits were with San Francisco and Cavite. Wailupe no longer needed to relay Cavite traffic through Guam since reliable communications had been established with Cavite using high frequencies. Guam traffic was routed via Cavite. The San Francisco and Cavite circuits were usually maintained on a 24 hour high speed basis using the automatic sending and receiving equipments. Some outages were experienced daily on the Cavite circuit. At those times messages were pre-punched for later transmission at high speeds when communications were restored. Improved signal keyers were provided during my tour of duty at Wailupe. Those keyers enabled us to feed a signal from the diversity station into a demodulator then to a control line to the transmitter station to key a transmitter. San Francisco was able to key the Pearl Harbor transmitter for direct transmission to Cavite. Cavite was able to duplicate that procedure in the opposite direction. Until those procedures were perfected by long experience, Wailupe continued to record and transcribe all transmissions from each station to insure that the distant station did in fact receive the transmissions. There was a high frequency circuit, on schedule, with Tutuila, American Samoa (NPU); another circuit also on schedule with Hilo (NPH); and a ship-shore circuit with Navy ships on 355 kHz split-foned with 500 kHz, the International Distress frequency. A FOX method broadcast for Navy ships used the TAW very low frequency transmitter at Pearl Harbor on 26.1 kHz. The FOX method of broadcasting to ships replaced the former intercept circuit between San Diego and Wailupe. The front part of the control building was unchanged from its original format. The DCO still occupied the front office and the Officer in Charge the next one. The original wireroom and the Traffic Chief's booth had been converted into equipment maintenance and battery rooms. The wireroom had been moved to a room adjoining the operating room. There, communication was maintained with the Honolulu, Pearl Harbor and Fleet Air communication offices by teletype - not page printers, but the old Western Union type that fed gummed tape through the machine which had to be glued to message blanks before delivery to the Traffic Chief for routing. Facilities at Wailupe in 1939 were meager, and an entirely new receiving and control station was under construction. 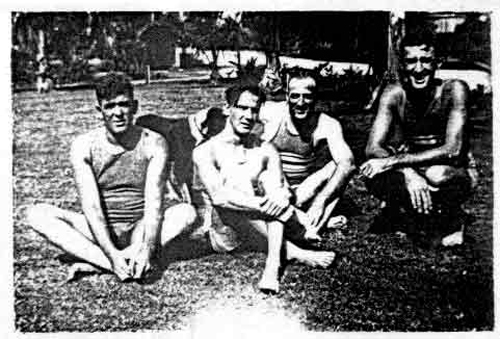 At Wailupe in December 1941 there were seventy-six men operating twelve positions to receive and send naval dispatches. High speed Boehme was employed on a continuous circuit with Cavite, and a similar circuit joined San Francisco with Wailupe. San Francisco was worked on the same circuit with Washington (NSS). Each of the two mainland stations handled traffic for alternate periods of fifteen minutes. Washington was received through San Francisco on an automatic relay basis. Wailupe worked Samoa (NPO), Wellington (ZLP), Auckland (ZLD) and Canberra (VHC) on a point to point manual circuit. Dutch Harbor, Peiping and Shanghai were worked one hour daily on direct circuits. A manually operated circuit via NAS Pearl Harbor, the Line Island Net, connected Naval Radio Station on Midway (NQM), Johnston (NIQ), Palmyra (NIX), and Wake (NCL) with Wailupe. Units afloat sent and received on 355 kHz and the 4235 series through its fourth harmonic, which were manned by Wailupe continuously. The 4235 series of four frequencies was covered by only one operator controlling on one transmitter which had to be shifted from one frequency to another in the event a ship called. A continuous watch was maintained on the International Distress Frequency, 500 kHz. Joint Army and Navy, Inshore Patrol, Local Defense, am Harbor communications were coordinated by several teletypewriter and radio circuits. The most important broadcast was the Primary Fleet (FOX) broadcast which was transmitted on the frequency of 26.1 kHz using the 500 kw VLF transmitter at Lualualei. Navy ships at sea am a majority of naval activities ashore copied the entire FOX broadcast. The Wailupe FOX was the most rapid way to get messages to ships." "Wailupe, too, was located on the seacoast and had neither splinter­proof nor bombproof buildings. So, on the morning of 10 December 1941, the District Communication Officer decided to have all radio equipment at Wailupe moved to Wahiawa. The new site was an excellent receiving area arid the best protected radio station of the entire district. Men worked night and day to transfer operations to Wahiawa. The move became a veritable scramble causing facilities to be installed more or less at random. Relocation was completed on 17 December without the slightest interruption of communications." Lualualei transmitter site - info, photos, 1953 tech report, 2012 renovation, equipment inventory 2010? In May 1888, the United States established a coaling station to service the vessels of the Pacific Fleet in Pearl Harbor. His Hawaiian Majesty King David Kalakaua had granted the U.S. the exclusive rights to enter and develop the area earlier that year. The U.S. Naval Radio Station in the Pearl Harbor area, the first government station in the islands, began operations on October 1, 1906. This radio station continued its operation until its deactivation in 1916. "SECRETARY OF THE NAVY, WASHINGTON, D.C. I HAVE THE HONOR TO SEND YOU THE FIRST THROUGH MESSAGE TO WASHINGTON, D.C., FROM PEARL HARBOR, HAWAII RADIO STATION, AND CAN REPORT SATISFACTORY PROGRESS OF THE PLANT. GEORGE R. CLARK SENDS." It became apparent after the war that the naval communication facilities in Hawaii could never revert to their small pre-war status, but would have to continue in the role of "big business." Because the requirements for rapid communications from the Department of the Navy to the fleet operational commanders had changed, the CNO authorized the activation of an additional teletypewriter system. This system, known as HICOM, was activated in 1957 and operated parallel to the existing communications channels. Later, the Commander in Chief, U.S. Pacific Fleet (CINCPACFLT), established an additional parallel circuit known as the "Atomic Strike Coordinator Circuit." It was determined that even more rapid communications would be necessary. Therefore, a new communications net, known as the "Naval Operation Net" was formed in 1959. At the same time, the Navy decided that the stations at Haiku and Heeia were no longer needed. 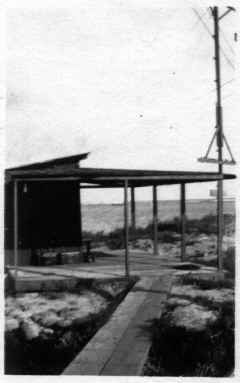 The station at Heeia was turned over to the Marine corps Air Station at Kaneohe, while the Haiku station was placed in a non-operational status. The Makalapa Local Digital Message Exchange (LDMX) was activated in March 1973 by Vice Admiral G. C. Talle, Deputy CINCPACFLT. The system's activation marked a significant step forward by improving writer-to-reader speed of service, message formatting, routing indicator assignment, and message recall for CINCPACFLT. In September 1977, the NAVCOMMACTS Pearl Harbor was disestablished and NTCC Camp Smith, NTCC Makalapa, NTCC Pearl Harbor, Secure Voice, and Consolidated Maintenance became separate departments of NAVCOMMSTA Honolulu. Concurrently, NTCC Moanalua was disestablished and the communication functions were turned over to the Fleet Weather Center. On February 18, 1977, the Commanding Officer at NAVCAMS EASTPAC officially dedicated the new Super High Frequency (SHF) Satellite Facility at Wahiawa, the largest such facility of its kind. Concurrently, the Navy's Satellite Facility at Helemano was deactivated. The command was again renamed on October 20, 1997. The new name, Naval Computer and Telecommunications Area Master Station, Pacific, better reflected the command's regional operating area.